This is my first ever blog, we will call it a practise blog if you like. The question I am choosing to answer is the one WordPress give you as a first blog inspiring type thing. There are a few experiences I could use that completely changed my life such as University or having my first serious boyfriend, but the experience I am choosing to write about is my total hip replacement. I had a total hip replacement on the 3rd August 2011 aged twenty-five, about a month after completing my university studies. This was something I had wanted for a while as I was starting to loose the plot being in that much pain everyday. I grew up with a condition called Perthes Disease (also known as Legg-Calve-Perthes disease). This is a childhood condition that affects the growth of the hip at the femur or ball and socket joint. The blood supply is insufficient to the femur and the bone becomes soft and breakdowns. My hip became very misshapen and undersized. Perthes seems to be random in who it can affect and there is no known reason for it. My first symptoms were groin and hip pain, and I started to limp. Walking more than a short distance became quite painful for me. I was then diagnosed aged about seven. I had to see doctors and specialists at various hospitals. I was in hospital for a week on traction (weights applied to my left leg to stretch the hip-joint and leg out) to prepare me for surgery. However when they came to do the surgery they opened me up and decided my hip was too far broken-down for any surgery to work. I think they were going to put a special immobilizing cast on my legs to stretch them out. Physiotherapy gave me crutches to use instead so I could walk without weight baring so much, which helped with the pain somewhat. Then apart from a couple more check ups they left me to it. I doubt there was much more they could do for me, but I wished they had explained this better to me. Over the years the amount of pain my hip gave me varied a lot. Sometimes it was almost pain-free and I walked with no aides at all. At other times I used crutches or a walking stick. When walking longer distances I would sometimes uses a wheelchair. My mum and I had to fight for any physiotherapy help at all at times. I had exercises given to me to do at home and had a few months of hydrotherapy. By my early 20s the pain was getting really bad again. I was told by a specialist that my hip was now fully grown so I no longer had Perthes, but early on sett osteoarthritis. This I gather is quite common for people who had more serious Perthes. I was given prescription strength pain killers and more physio and then once again left to deal with it myself. I managed a few more years and did find the pain killers helped me manage day-to-day life. However by the age of twenty-four I found myself needing to take more pain relief to cope and that sometimes the pills were just not working for me. I started having to use more things to help with the pain including a tens machine and heat pads. I was also getting worried about how much pain medication I was taking, as it can sometimes make you ill in other ways if you take it a lot for a long time. I was back on crutches by the age of twenty-five as I was finding walking so painful. I had asked a few years before about having a hip replacement, but was told by surgeons that I was too young as false hips do not last that long and you can only have so many in one life-time. However I saw another specialist surgeon aged twenty-five. At this point I was in Lincoln for university so I saw a different surgeon. This one took one look at my x-ray and said my hip was hardly there any more and I could have a replacement if I wanted to. I knew almost straight away that I wanted to say yes. I spent a total of three days in hospital including some physiotherapy post surgery. I was given a series of short exercises to do twice a day at home to help me get stronger again. Recovery was a long slow processes and sometimes quite frustrating and painful. I was told full recovery normally takes about six months to a year. I started to see progress bit by tiny bit almost on a daily basis. I was on some pretty strong pain medication for a while and had to wear surgical stockings for six weeks to prevent DVT. Once back home in Devon I had more physiotherapy and leant a new set of exercises to really get my leg muscles strong again. I went to the hospital gym once a week for twelve weeks. I would say full recovery took me about nine months. 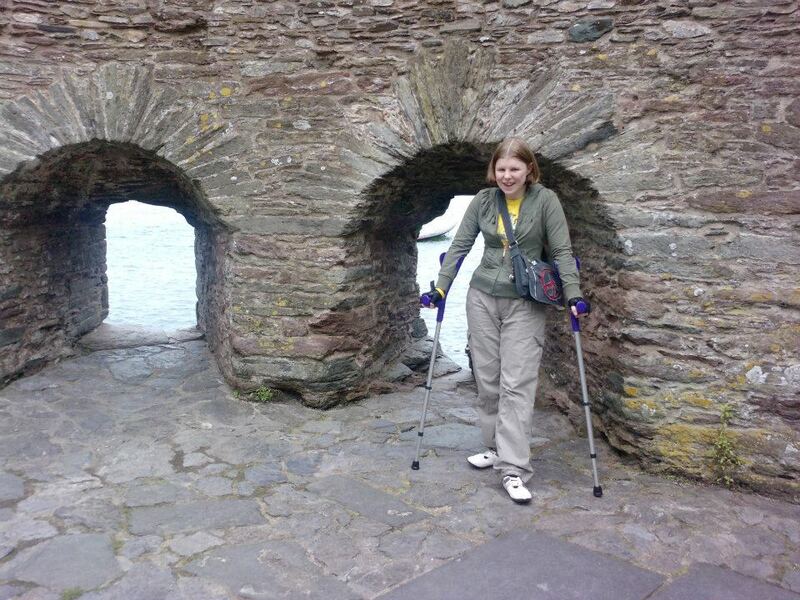 Ten months after surgery I took part in a ten-mile walk for charity, my feet hurt, but my hip was pain free! Although recovery took a long time and it hurt a lot, I am very very glad I had my hip replacement. I can now walk further, stand for longer and do many more things. I am now fitter than I have ever felt in my life. I can apply for many more jobs that require standing and walking. I can go out with other people and join in more fully. Since my operation I have become an aunt, which is fantastic. I think one of the best thing about having a pain free hip is how much more I can do with my nephew. I can join in with a walk to the park or chase him round the house. I was told my hip will last fifteen to twenty years before it needs replacing. False hips last longer now than they did even a few years ago and keep improving all the time. I hope by the time I have my next hip they last even longer.